The Mess That Greenspan Made: Five years and a new mess! Five years and a new mess! It's been exactly five years since publication began at this blog and, if all goes well, this will be the second-to-last post at this location since a new and better self-hosted blog has been taking shape over the last month and, quite frankly, your humble scribe has long since grown tired of double-posting everything. The new URL is: http://www.timiacono.com and the next (and last) post that you'll see here at this blog will have additional information about RSS, Twitter, and the like, though most of you can probably figure that stuff out on your own. 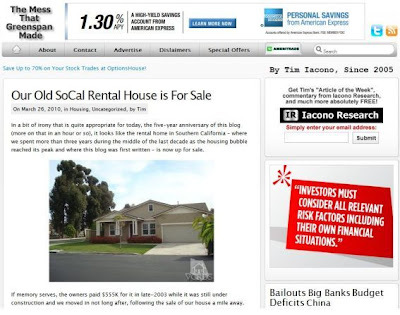 As for the five year anniversary, the previous item about our old rental house brought back some memories of working a full-time software job, writing the blog, and launching the investment website back in Southern California. I must say, I'm happy to be out of there, though, I do sometimes miss the weather. As has become the custom around here on this day, looking back to March 26th, 2005 we find this very first post on a Stephen Roach commentary, one that still rings true today. Recall that, at the time, short-term rates had just begun to rise from 1.0 percent in mid-2004 and the housing bubble was entering new and more dangerous phases about every six months. This five-year old commentary seems all the more strange as many people are already talking about short-term rates beginning to rise once again sometime in the next year. Well Tim, it's been a nice long ride. Welcome to the 21st century and the hosting of your own blog. I'm glad to see the transition to a more web 2.0 technology. The sadder side of things are, that I don't see the economy having any better prospects than when I found your blog by Google®ing "The Mess That Greenspan Made" some 5 years ago. I can't believe it's been that long. When I found your blog, I was sitting in my extremely overpriced La Jolla condo (renting) wondering if things were going to finally blow up this time around. I've since moved twice, first to Hollywood, then to Venice Beach - all the time renting for far below the price for owning while my saved up down payment for a home purchase has been solidly gaining while invested in precious metals. I see that you've moved around a bit yourself. Perhaps those who think that Greenspan, or poor Federal Reserve policy played a large component in this mess are nomadic by nature? Keep up the good work and thank you very much for your point of view and the time you take to express it each day. On another, technical note. I'm sure WordPress has some plugins to keep your search rankings high (some SEO), but isn't there also a plug-in that pushes your posts automatically to blogger.com so that you still get Google's, blogger brand SEO? I looked into setting up a personal blog a short while ago and found that I could publish simultaneously, however, it's been some time since I looked into it. I'm sure you've got all your bases covered, just thought I'd float the thought. Cheers. And I'll see you over at the new site. I'm still getting familiar with everything that Wordpress can do but I think I want to let the Blogger blog as is. I just need to make sure it doesn't get shut down due to inactivity. Why people who blog for more many years, and then just a single day, they moved already their site. new site looks much nicer but i'm no fan of worpress which i presume it runs on.